The number of law reviews using Scholastica continues to grow, with over 200 student law journals accepting submissions via the site this fall. We’re thrilled to have so many law review editors using Scholastica to more easily manage all aspects of the article selection process - from accepting submissions, to coordinating article review and selection, and managing editor and author communications. Often, editors learning about Scholastica for the first time will ask us if they can talk to an editor from a journal already using the site to hear about their experience. Our users have been eager to help other journals get on board and have offered tons of great insights for fellow editors. With permission, we’ve taken some of the feedback we’ve received from editors about how Scholastica is helping their law review and created the infographic below. 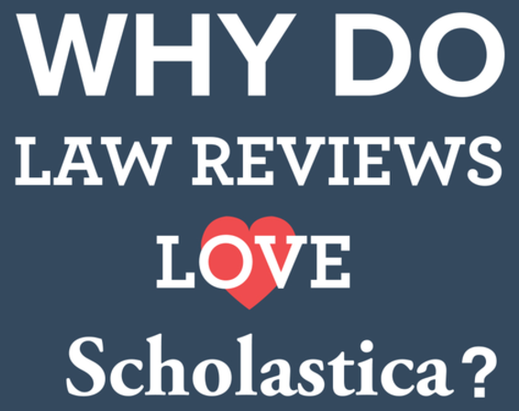 Check it out, and see what law review editors have to say about managing their submissions on Scholastica! *Contributions made by members of each law review’s 2014-2015 editorial board. Ashley Heidemann, Founder of JD Advising, LLC, shares some legal writing do's and don'ts that everyone needs to be reminded of sometimes.